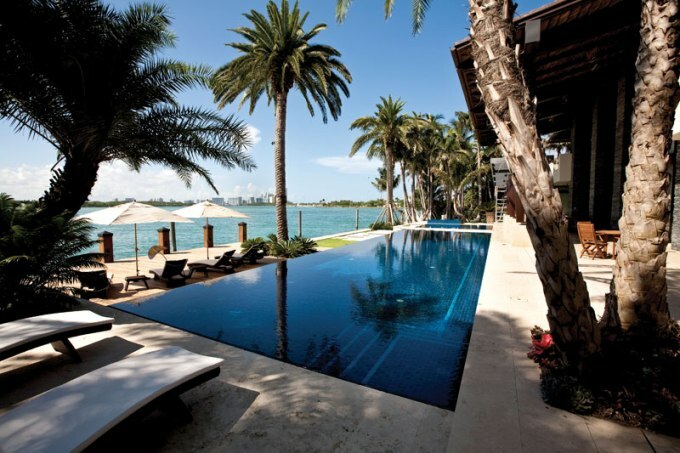 Swimming pool designs incorporate the use of ceramic, concrete, glass, or travertine tiles. The type of material used depends on several factors including the shape of the pool, its depth, and the appearance of the surrounding landscape. Safety is a primary concern when choosing which materials are used for the interior surface of the pool, the bondbeam or coping, and the outside deck area. Premium quality tiles made from ceramic, marble, and glass are available from Stonexchange, a direct importer and distributor of natural stone products. We are located in Miami, Florida, but our company ships commercial-sized orders of tile and mosaics to any destination in the continental United States. Many of the popular styles and colors of tile carried by Stonexchange are showcased on the Nalboor Tiles website. Which Types Of Natural Stone Tiles Are Safe? The perimeter of the swimming pool and the flat coping is often wet and slippery because of water splash. It is therefore important to choose a material that is slip-resistant. Most ceramic tiles can be given a coating treatment to slightly increase friction. Tiles used for the coping and surrounding deck surface should be waterproof. They should also be protected against ultraviolet radiation. Most ceramic tiles are graded according to their toleration to low temperatures. In northern climates, choosing a frost-proof tile is of utmost importance. Inexpensive tiles that do not meet standards for cold weather exposure will crack, and this causes a hazard for people as well as an entry point for moisture. Travertine is commonly used around the exterior of the pool. This natural limestone is rustic in appearance, has a semi-rough texture, and can be treated with special sealants for complete waterproofing. Travertine tiles are usually honed and filled, smoothed with a special type of sanding apparatus, and given a spray application to make them waterproof. Travertine works quite well as a bondbeam or coping surface, and is very slip-resistant. Remember that the pool coping will jut out over the top of the side walls. This can be a real danger if the edges of the tile are straight. Instead, use bullnose pieces for the coping. This results in a smooth, rounded surface and greatly reduces the possibility of serious injury to pool users. Marble tiles can be used as a perimeter decking material, but the tiles should be honed instead of polished. Polished marble is very slippery and creates a slipping hazard. Remember to use special sealing compounds that increase friction when marble is used for the bondbeam or surrounding deck tiles. Safe Tiles for Use as Pool Linings. The appearance of the pool’s interior is created by the choice of tiles used to line the walls and bottom. These tiles reflect light that shines through the water, and the effect can be quite dazzling. When choosing what type of tile to use for the interior walls of the pool, remember that the surrounding environment will play a part in determining the overall appearance. Ceramic tiles are popular because of their affordability. Most ceramic tiles cost less than $2.00 per square yard of material. However, some manufacturers do not carry tiles that are resistant to the fading effects caused by chlorinated water. Some ceramic tiles are not frost-free, and this can become a problem if the pool is drained in the wintertime. The appearance of the pool’s interior should blend nicely with the surrounding environment. If the yard is traditional in color and dominated by lawn grass, a simple blue ceramic interior will look beautiful. On the other hand, leafy foliage and rock walls will blend well with glass mosaic tiles. The floor of the pool should be covered with concrete, natural stone, or ceramic tiles that can handle a tremendous amount of weight. Some types of natural stone will attract scum and bacteria. Ceramic can be used for the bottom of the pool, but some types are not graded as safe for this type of use. Travertine is not a good choice for the interior of the pool. This stone is quite resistant to water pressure despite its brittle appearance, but it is also quite rough to the touch and will cause scraping injuries. Glass mosaics are generally not used for the bottom of the pool because they are quite thin and will also accumulate organic scum. It is very important to contract the services of a knowledgeable, licensed, and experienced tile installer who knows exactly how pool tiles should be placed. Not only will the overall appearance of the swimming area be affected by the tile design and placement, the safety of all who use the pool depends on how well the individual pieces are set and sealed. Natural stone tiles are created using slabs of raw material cut from quarries. The slabs are transformed into tiles through the use of specialized cutting and shaping equipment. Ceramic tiles are formed using an advanced kiln firing process and are coated to give them protection from the elements. Stonexchange is a manufacturer and importer of premium quality tiles, ceramic pieces, and mosaics. We own the facilities where our products are fabricated, and we import large quantities of product on a year-round basis. Our customers include flooring companies, home improvement centers, building contractors, and independent installers. Nalboor Tiles is the online shopping center for each style and color of tile we produce and market. Customers will find a vast array of marble, travertine, ceramic, and mosaic tiles available. These products are usually purchased in bulk by our commercial clients, and these customers enjoy truly wholesale pricing on full-crate orders of material. Pool designs usually specify the use of several different types of stone or ceramic tile. This can be a problem for contractors who need to find an affordable price for coping tiles, glass or mosaic tiles for the pool interior, and perhaps travertine or marble for the decking area. The best bet for getting reasonable pricing on mix-and-match orders is to go directly to the materials source, and this is where Stonexchange enters the picture. Not only does our company offer the lowest wholesale prices in the industry, we can modify an order to include non-standard size mosaics, ceramic tiles, and marble tile blocks. Many contractors balk at placing a bid for a customized swimming pool layout design because they do not feel they can purchase all the different materials at a cost that will please the consumer. Stonexchange offers a most affordable means to obtain exactly what the design specifies, and the final cost of materials is far less than retail. Some Examples of Our Product Line. The very same materials used to create our window sills, thresholds, and countertop blocks are used in the fabrication of our mosaic tiles. Our travertine tiles are manufactured from the same material that goes into the creation of our kitchen backsplash tiles and shower stall surfaces. We manufacture our own line of ceramic pool copings and interior wall tiles, and these are available in a myriad of contemporary and classic designs. All of our material types – marble, travertine, and ceramic – can be custom-shaped to fill a particular order request. Some pool designs call for extra-thick bondbeams with oversized bullnoses. Many designs use diagonally shaped natural stone tiles for the perimeter decking area. Our company can fabricate non-standard sizes and shapes to comply with nearly any order request. Our travertine is of the highest grade and is superior in quality to that offered by most competitors. This material has been expertly honed and filled, is treated to resist moisture intrusion and fading, and works exceptionally well as an outdoor pool decking surface. Our ceramic tiles are available in a wide range of colors. They are suitable for use as an interior wall for pools and are guaranteed to retain their color for years. We also stock marble tiles in the most commonly requested colors including off-white with gray streaking, cream/beige, and red/brown. Our Miami-area warehouse and distribution center is filled to the rafters with all of the product types mentioned above. Orders for less than 4,000 square feet can usually be processed and shipped in less than two business days. Contractors needing an extremely large amount of material for multiple pool installation jobs can rely on our company to supply full container loads sent directly from our overseas manufacturing facility. Remember, the lowest prices are based on large quantities of material, but all who purchase from Stonexchange will enjoy wholesale pricing, with no markups for custom orders. Get In On the Savings. At Stonexchange, quality is not sacrificed for the sake of low prices. We can offer our customers wholesale pricing because we are the original producer of the materials we bring to the market. All of our natural stone and ceramic products are of the highest quality and will meet or exceed customer expectations. Start saving money today by ordering direct from the manufacturer. Contact us, the most affordable marble wholesaler in Florida, today and ask about our line of ceramic and natural stone materials suitable for pool construction. You will be quite pleased with what we have to offer, and you will be even happier with our price quote.